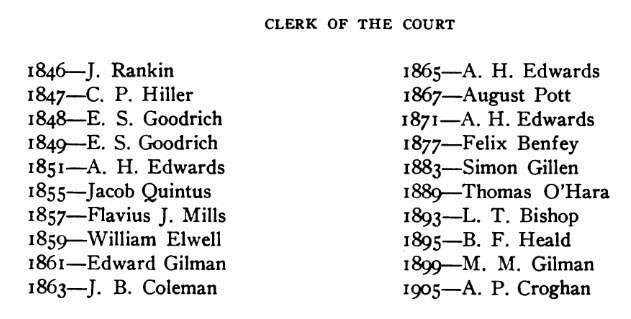 The reader will have noticed that names of county officials are given in the above list prior to 1860. These were obtained by searching through the files of newspapers. Wilson, George W. Weeden, chairman; Greenbush, Erastus Keach; Herman, Ludwig Luecke; Holland, Peter Daane, Jr.; Lima, Thomas Walsh; Lyndon, H. L. Hutchinson; Mosel, William Wippermann; Plymouth, C. W. Prescott; Mitchell, Phelin Hughes; Rhine, Eric Tallmadge; Russell, John Keenan; Scott, Abraham Laycock; Sherman, John P. Carroll; Sheboygan, William Ashby; Sheboygan Falls, Henry Tidman; Sheboygan Falls village, John P. Robinson; city of Sheboygan, first ward, Francis Geele; second, J. O. Thayer; third, J. C. Reich; fourth, William Demand. Wilson, George W. Weeden, chairman; Greenbush, N. H. Roberts; Herman, Frederick Arpke; Holland, Peter Daane, Jr.; Lima, Timothy O'Connor; Lyndon, H. A. Forbes; Mitchell, Phelin Hughes; Mosel, William Wippermann; Plymouth, Enos Easterman; Rhine, Julius Wolflf; Russell, John Keenan; Scott, Jacob Reis; Sheboygan, William Ashby; Sheboygan Falls, Henry Tidman; Sheboygan Falls village, John E. Thomas; Sherman, John P. Carroll; city of Sheboygan, first ward, John Sandrok; second, Joseph Keseberg; third, August Froehlich; fourth, W. B. Darling. Wilson, George W. Weeden, chairman; Greenbush, N. H. Roberts; Herman, Ludwig Luecke; Holland, Peter Daane, Jr.; Lima, Thomas Walsh; Lyndon, E. C. Butters; Mitchell, C. W. Humphrey; Mosel. 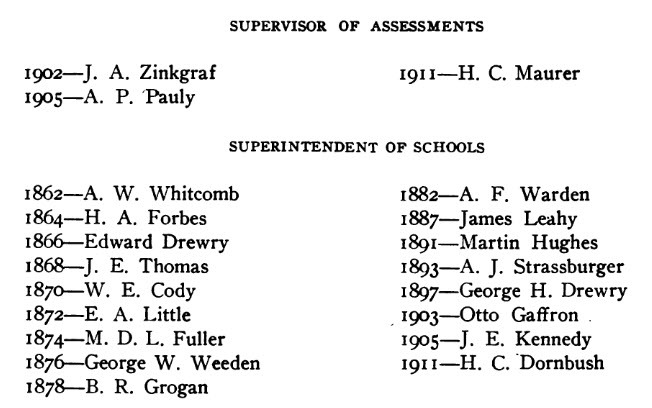 William Wippermann; Plymouth, Enos Eastman; Rhine, Julius Wolff; Russell, John Keenan; Scott, Jacob Reis; Sheboygan, G. A. Willard; Sheboygan Falls, Henry Tidman; Sheboygan Falls village, N. C. Farnsworth; Sherman, John P. Carroll; city of Sheboygan, first ward, John Sandrok; second, John O. Thayer; third, J. C. Reich; fourth, A. Trester. Wilson, George W. Weeden, chairman; Greenbush, Olney Higgins; Herman, Ludwig Luecke; Holland, J. H. Van Ouwerkerk; Lima, Thomas Walsh; Lyndon, S. D. Hubbard; Mitchell, C. W. Humphrey; Mosel, Charles Wippermann; Plymouth, C. W. Prescott; Rhine, Julius Wolff; Russell, John Keenan; Scott, Jacob Blanshan; Sheboygan, G. A. Willard; Sheboygan Falls, Henry Tidman; Sheboygan Falls village, Albert Dennett; city of Sheboygan, first ward, John Sandrok; second, John O. Thayer; third, Charles Grasse; fourth, Henry Scheele. Sheboygan Falls, John E. Thomas, chairman; Greenbush, William H. Qark; Herman, Friedrich Hasche; Holland, Anton Van De Wall; Lima, Thomas Walsh; Lyndon, Norman C. Harmon; Mitchell, C W. Humphrey; Mosel, William Wippermann; Plymouth, Enos Eastman; Rhine, Julius Wolff; Russell, John Keenan; Scott, Israel J. Smith; Sheboygan, G. A. Willard; Sheboygan Falls, Henry Tidman; Sherman, John P. Carroll; Wilson, Michael Trimberger; Sheboygan city, first ward, John Sandrok; second, John O. Thayer; third, Charles Grasse; fourth, Henry Scheele. 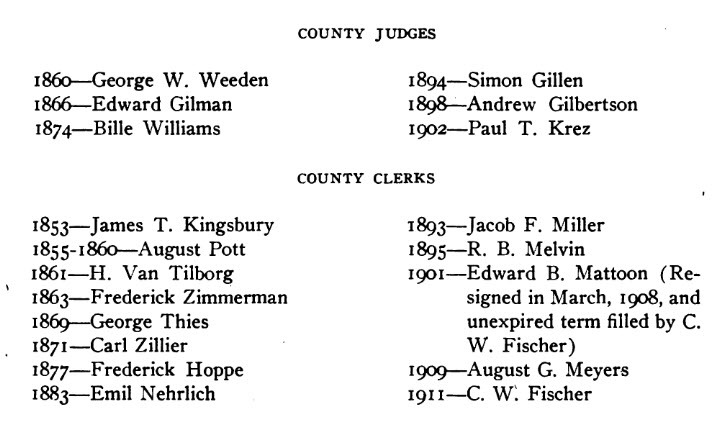 Sheboygan Falls village, John E. Thomas, chairman; Greenbush, Erastus Keach; Herman, Henry Luecke; Holland, Anton Van De Wall; Lima, Thomas Walsh; Lyndon, Norman C. Harmon; Mitchell, Hugh Lynch; Mosel William Wippermann; Plymouth, Asa Carpenter; Rhine, Julius Wolff; Russell, John Keenon; Scott, Israel J. Smith; Sheboygan, G. A. Willard; Sheboygan Falls, Edward Heidenreiter; Sherman, John P. Carroll; Wilson, Carl Reich; city of Sheboygan, first ward, James H. Mead; second, John O. Thayer; third, Charles Grasse; fourth, Joseph Weiskopf. 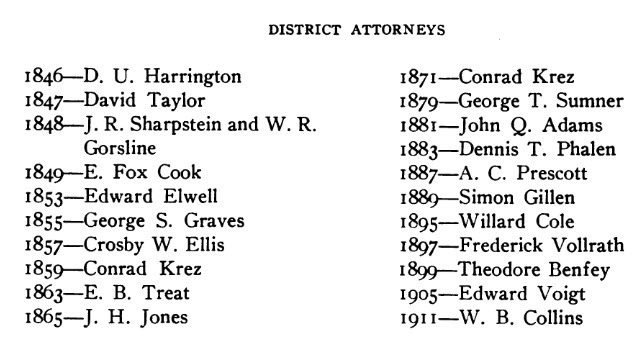 Lyndon, S. D. Hubbard, chairman; Greenbush, Erastus Keach; Herman, Ludwig Luecke; Holland, Charles Rogers; Lima, A. D. De Land; Mitchell, Hugh Lynch; Mosel, William Wippermann; Plymouth, William Schwartz; Rhine, Julius Wolff; Russell, John Keenan; Scott, Israel J. Smith; Sheboygan, G. A. Willard; Sheboygan Falls, Edward Heidenreiter; Sheboygan Falls village, Israel Adriance; Sherman, James White; Wilson, Carl Reich; City of Sheboygan, first ward, Michael Winter; second, James Bell; third, Charles Boehme; fourth, G. Dieckmann; fifth, Matthew Meyer. Sheboygan, Carl Zillier, chairman; Greenbush, Erastus Keach; Herman, Frederick Hasche; Holland, Charles Rogers; Lima, Thomas Walsh; Lyndon, Eugene Mclntyre; Mitchell, Hugh Lynch; Mosel, Peter Augustine; Plymouth, Asa Carpenter; Rhine, George Gessert; Russell, John Keenan; Scott, F. Hazelton; Sheboygan, August Zschetzsche; Sheboygan Falls, Edward Heidenreiter; Sheboygan Falls village, W. H. Prentice; Sherman, James White; Wilson, Carl Reich; city of Sheboygan, first ward, William Elwell; third, J. Mogenson; fourth, G. Dieckmann; fifth, Charles Grasse; city of Plymouth, first ward, H. W. Fisher; second, George W. Barnard. Sheboygan, Carl Zillier, chairman; Greenbush, Erastus Keach; Herman, August Selsemeyer; Holland; Charles Rogers; Lima, Thomas Walsh; Lyndon, Eugene Mclntyre; Mitchell, James Hughes; Mosel, Peter Augustine; Plymouth, Asa Carpenter; Rhine, Valentine Pfeil; Russell, John Keenan; Scott, John Ruch; Sheboygan, August Zschetzsche; Sheboygan Falls, Hiram Smith; Sheboygan Falls village, John E. Thomas; Sherman, James White; Wilson, George W. Weeden; city of Sheboygan, first ward; William Elwell; third, John Mogenson; fourth, C. B. Henschel; fifth, Charles Grasse; Plymouth; first, H. W. Fischer; second, George W. Barnard. Sheboygan, Carl Zillier, chairman; Greenbush, Erastus Keach; Herman, August Selsemeyer; Holland, Charles Rogers; Lima, A. D. De Land; Lyndon, Eugene Mclntyre; Mitchell, James Hughes; Mosel, Peter Augustine; Plymouth, George W. Bradford; Rhine, George Gessert; Russell, John Keenan; Scott, John Ruch; Sheboygan, August Zschetzsche; Sheboygan Falls, Hiram Ashcraft; Sheboygan Falls village, John E. Thomas; Sherman, James White; Wilson, Carl Roehrborn; city of Sheboygan, first ward, William Elwell; third, James Mogenson; fourth, C. B. Henschel; fifth, Charles Grasse; Plymouth, first ward, J. W. Taylor; second, William Schwartz. Sheboygan, Carl Zillier, chairman; Greenbush, John Dennis; Herman, August Selsemeyer; Holland, E. C. Oliver; Lima, A. D. De Land; Lyndon, Eugene Mclntyre; Mitchell, Simon Gillen; Mosel, Peter Augustine; Plymouth, George W. Bradford; Rhine, T. C. Sharpe; Russell, John Keenan; Scott, John Ruch; Sheboygan, William Ashby; Sheboygan Falls, John Dietsch; Sheboygan Falls village, G. H. Brickner; Sherman, James White; Wilson, Carl Roehrborn; city of Sheboygan, first ward, William Elwell; third, John Williamson; fourth, J. M. Kohler; fifth, Fred Nagel; Plymouth, first ward, J. W. Taylor; second, William Schwartz. Sheboygan, Carl Zillier, chairman; Greenbush, John Dennis; Herman, J. Bodenstab; Holland, E. C. Oliver; Lima, T. O'Connor; Lyndon, Eugene Mclntyre; Mitchell, Simon Gillen; Mosel, Peter Augustine; Plymouth, H. Wheeler; Rhine, T. C. Sharpe; Russell, John Keenan; Scott, John Rich; Sheboygan, C. M. Limprecht; Sheboygan Falls, John Kaestner; Sheboygan Falls village, J. E. Thomas; Sherman, James White; Wilson, Carl Reich; city of Sheboygan, first ward, William Elwell; third, Charles Boehme; fourth, J. M. Kohler; fifth, Fred Nagel; Plymouth, first ward, H. W. Fischer; second, George W. Barnard. Sheboygan, Carl Zillier, chairman; Greenbush, G. S. Putnam; Herman, Frederick Hasche; Holland, Henry Walvoord; Lima, A. D. De Land; Lyndon, Eugene Mclntyre; Mitchell, J. F. Murray; Mosel, Charles W. Prescott; Rhine, T. C Sharpe; Russell, John Keenan; Scott, John Ruch; Sheboygan, G. A. Willard; Sheboygan Falls, John Kaestner; Sheboygan Falls village, B. F. Heald; Sherman, James White; Wilson, Carl Reich; Sheboygan city, first ward, William Elwell; third, Charles Boehme; fourth, August Trill- ing; fifth, Fred Nagel; Plymouth, first ward, George W. Barnard; second, E. A. Streblow. Sheboygan, Carl Zillier, chairman; Greenbush, G. S. Putnam; Herman, August Selsemeyer; Holland, Henry Walvoord; Lima, Christian Oeder; Lyndon, W. A. Barber; Mitchell, J. F. Burke; Mosel, Peter Augustine; Plymouth, Charles W. Prescott; Rhine, T. C. Sharpe; Russell, John Keenan; Scott, John Ruch; Sheboygan, O. Gearlds; Sheboygan Falls, George Whiffen; Sheboygan Falls village, J. H. Reysen; Sherman, James White; Wilson, W. Springborn; city of Sheboygan, first ward, William Elwell; third, Charles Boehme; fourth, August Trilling; fifth, Fred Nagel; Plymouth, first ward, William Fischer; second, J. L. Santec. Sheboygan, William Elwell, chairman; Greenbush, G. S. Putnam; Herman, August Selsemeyer; Holland, E. C. Oliver; Lima, T. O'Connor; Lyndon, C. N. Harmon; Mitchell, J. F. Burke; Mosel, Peter Augustine; Plymouth, Asa Carpenter; Rhine, T. C. Sharpe; Russell, John Keenan; Scott, J. W. Liebenstein; Sheboygan, O. Gearlds; Sheboygan Falls, George Whiflfen; Sheboygan Falls village, E. Foster; Sherman, James White; Wilson, W. Springborn; Sheboygan, second ward, Joseph Keseberg; third, P. Martin; fourth, August Trilling; fifth, Fred Nagel; Plymouth, first ward, William Fischer; second, M. D. L. Fuller. Sheboygan, William Elwell, chairman; Greenbush, G. S. Putnam; Herman, Ludwig Luecke; Holland, E. C. Oliver; Lima, A. D. De Land; Lyndon, C. N. Harmon; Mitchell, John Bowser; Mosel, Albert Erdmann; Plymouth, Asa Carpenter; Rhine, T. C. Sharpe; Russell, John Keenan; Scott, J. W. Liebenstein; Sheboygan, August Zschetzsche; Sheboygan Falls, George U. Whiffen; Sheboygan Falls village, B. F. Heald; Sherman, W. H. Foley; Wilson, William Springbom; city of Sheboygan, second ward, Christian Ackermann; third, P. Martin; fourth, F. W. Margenau; fifth, H. J. Friedrichs; Plymouth, first ward, John Kaestner; second, W. Schwartz. Sheboygan, William Elwell, chairman; Greenbush, G. S. Putnam; Herman, Henry G. Mueller; Holland, E. C. Oliver; Lima, A. D. De Land; Lyndon, E. Mclntyre; Mitchell, John Bowser; Mosel, Albert Erdmann; Plymouth, H. Krumrey; Rhine, George WolflF; Russell, John Keenan; Scott, J. W. Liebenstein; Sheboygan, August Zschetzsche; Sheboygan Falls, George U. Whiflfen; Sheboygan Falls village, Charles S. Weisse; Sherman, W. H. Foley; Wilson, W. Springborn; city of Sheboygan, second ward, Christian Ackermann; third, J. Mogenson; fourth, F. Margenau; fifth, Ernst Lutze; Plymouth, first ward, John Kaestner; second, W. Schwartz. Sheboygan, Carl Zillier, chairman; Greenbush, N. H. Roberts; Herman, William F. Sieker; Holland, Henry Walvoord; Lima, A. D. De Land; Lyndon, E. Mclntyre; Mitchell, John Bowser; Mosel, Albert Erdmann; Plymouth, H. Krumrey; Rhine, George Wolflf; Russell, John Keenan; Scott, J. W. Liebenstein; Sheboygan, August Zschetzsche; Sheboygan Falls, George U. Whiflfen; Sherman, W. H. Foley; Wilson, Carl Roehrborn; Sheboygan Falls village, William Rensis; city of Sheboygan, first ward, William Elwell; second, Christian Ackermann; fourth, Frederick Boseck; fifth, B. Renzelmann; sixth, Ernst Lutze; seventh, Herman Strains; eighth, Henry Brand; Plymouth, first ward, Carl Schwartz; second, William Schwartz. Sheboygan, Carl Zillier, chairman; Greenbush, N. H. Roberts; Herman, William F. Sieker; Holland, Henry Walwoord; Lima, A. D. De Land; Lyndon, E. Mclntyre; Mitchell, J. F. Burke; Mosel, Carl Wippermann; Plymouth, Henry B. Wheeler; Rhine, George W. Wolff; Russell, Jacob Sinz; Scott, J. W. Liebenstein; Sheboygan, William D. Mueller; Sheboygan Falls, John Dassow; Sheboygan Falls village, Charles S. Weisse; Sherman, James White; Wilson, Carl Roehrborn; city of Cheboygan, first ward, J. DeSmidt; second, Christian Ackermann; fourth, John Mogenson; fifth, B. Renzelmann; sixth, Ernst Lutze; seventh, Herman A. Strains; eighth, Henry Brand; Plymouth, first ward, Adam Wolflf; second, William Schwartz. Sheboygan, Carl Zillier, chairman; Greenbush, N. H. Roberts; Herman, William F. Sieker; Holland, Henry Walvoord; Lima, A. D. De Land; Lyndon, W. A. Barber; Mitchell, John F. Burke; Mosel, Carl Wippermann; Plymouth, Henry Wheeler; Rhine, George W. Wolff; Russell, Jacob Sinz; Scott, J. W. Liebenstein; Sheboygan, Owen Gearlds; Sheboygan Falls, John Dassow; Sheboygan Falls village, Charles S. Weisse; Sherman, William H. Foley; Wilson, Carl Roehrbom; city of Sheboygan, first ward, J. DeSmidt; second, Fred Oetking; fourth, John Freimuth; fifth, B. Renzelmann; sixth, Ernst Lutze; seventh, H. Strains; eighth, Henry Brand; Plymouth, first ward, George W. Monk; second, L. T. Bishop. Sheboygan, Carl Zillier, chairman; Greenbush, N. H. Roberts; Herman, William F. Sieker; Holland, Henry Walvoord; Lima, Dr. F. L. CoUer; Lyndon, W. A. Barber; Mitchell, R. Phalen; Mosel, Albert Erdmann; Plymouth, Henry Wheeler; Rhine, George W. Wolff; Russell, Jacob Sinz; Scott, J. W. Liebenstein; Sheboygan, Owen Gearlds; Sheboygan Falls; John Dassow; Sheboygan Falls village, William Rensis; Sherman, Charles Ferk; Wilson, Valentine Reyer; city of Sheboygan, first ward. Otto Geussenhainer; second, Fred Oetking; fourth, John Freimuth; fifth, B. Renzelmann; sixth, Alex Schirmer; seventh, H. Strains; eighth, Henry Brand; Plymouth, first ward, H. W. Fischer; second, L. T. Bishop. Sheboygan, Carl Zillier, chairman; Greenbush, C. A. Corbett; Herman, William F. Sieker; Holland, Henry Walvoord'; Lima, Dr. F. L. Coller; Lyndon, C. R. Mead; Mitchell, J. J. Crosby; Mosel, Fred'Festerling; Plymouth, Henry Waterman; Rhine, George W, Wolff; Russell, Jacob Sinz; Scott, J. W. Liebenstein; Sheboygan, Owen Gearlds; Sheboygan Falls, John Dassow; Sheboygan Falls village, William Rensis'; Sherman, -Charles Ferk; Wilson, Valentine Reyer; city of Sheboygan, first wai'd. Otto Guessenhainer; second, Fred Oetking; fourth, John Freimuth; fifth, Peter Friedrichs; sixth, Ernst Lutze; seventh, H. Strains; eighth, Henry Brand; Plymouth, first ward, H. W. Fischer; second, L. T. Bishop. Sheboygan, Carl Zillier,, chairman; Greenbush, C. A. Corbett; Herman, William F. Sieker; Holland, Sylvester Palmer; Lima, Henry Walsh; Lyndon, C. R. Mead; Mitchell, J. J. Crosby; Mosel, Fred Festerling; Plymouth, Henry Waterman; Rhine, George W. Wolff; Russell, Jacob Sinz; Scott, J. W. Liebenstein; Sheboygan, Owen Gearlds; Sheboygan Falls, John Dassow; Sheboygan Falls village. Lane Constance; Sherman, James Leahy; Wilson, Valentine Reyer; city of Sheboygan, first ward, Otto Geussenhainer; second, Frederick Oetking; fourth, John Freimuth; fifth, B. Renzelmann; Sixth, Ernst Lutze; seventh, H. A. Strains; eighth, Henry Brand; Plymouth, first ward, H. W. Fischer; second, L. T. Bishop. Sheboygan, Carl Zillier, chairman; Greenbush, C. A. Corbett; Herman, William F. Sieker; Holland, Sylvester Palmer; Lima, Henry Walsh; Lyndon, W. A. Barber; Mitchell, J. J. Crosby; Mosel, Fred Festerling; Plymouth, Henry Waterman; Rhine, George W. Wolff; Russell, Jacob Sinz; Scott, J. W. Liebenstein; Sheboygan, Charles M. Ries; Sheboygan Falls, John Dassow; Sheboygan Falls village. Lane Constance; Sherman, James Leahy; Wilson, Valentine Reyer; city of Sheboygan, first ward, Henry Schuri; second, Fred Oetking; fourth, D. W. Halsted; fifth, Jacob Brehm; sixth, Ernst Lutze; seventh, H. A. Strains ; eighth, F. W. Margenau; Plymouth, first ward, H- W. Fischer; second, E. A. Kennedy. Sheboygan, Carl Zillier, chairman; Greenbush, N. H. Roberts; Herman, W. F. Sieker; Holland, S. Palmer; Lima, C. D. De Long; Lyndon, W. A. Barber; Mitchell, David Hughes; Mosel, Fred Festerling; Plymouth, H. Wheeler; Rhine, George W. Wolff; Russell, Jacob Sinz; Sheboygan, Owen Gearlds; Sheboygan Falls, John Dassow; Sheboygan Falls village, A. J. Lumsden; Scott, J. W. Liebenstein; Sherman, James Leahy; Wilson, Valentine Reyer; city of Sheboygan, first ward, D. W. Halsted; second, Fred Oetking; fourth, August Rieboldt; fifth, Jacob Brehm; sixth, Ernst Lutze; seventh, A. H. Strains; eighth, Robert Neumeister; Plymouth, first ward, H. W. Fischer; second, E. A. Kennedy. Rhine, George W. Wolff, chairman; Greenbush, G. C. Mayhew; Herman, Fred Braun; Holland, S. Palmer; Lima, C. D. De Long; Lyndon, W. A. Barber; Mitchell, David Hughes; Mosel, Fred Festerling; Plymouth, H. Waterman; Russell, Jacob Sinz; Sheboygan, Owen Gearlds; Sheboygan Falls, Carl Schlichting; Sheboygan Falls village, Charles S. Weisse; Scott, J. W. Liebenstein; Sherman, James Leahy; Wilson, Valentine Reyer; Elkhart Lake village, August Riess; city of Sheboygan, first ward, W. H. Burk; second, Charles B. Freiberg; third, John Balzer, Jr.; fourth, Joseph Cooper; fifth, Charles Brickner; sixth, Dietrich Burhop; seventh, Henry Oehlmann; eighth. Robert Neumeister; Plymouth, first ward, H. W. Fischer; second, C. R. Mead. Rhine, George W. Wolff, chairman; Greenbu^, G. C. Mayhew; Herman, William F. Sieker; Holland, S. Palmer; Lima, H. Walsh; Lyndon, L. C. Bartlett; Mitchell, J. F. Murray; Mosel, Fred Festerling; Plymouth, H. Wheeler; Russell, Charles Smith; Sheboygan, Owen Gearlds; Sheboygan Falls, Carl Schlichting; Sheboygan Falls village, John Blust; Scott, J. W. Liebenstein; Sherman, G. Franzen; Wilson, Valentine Reyer; Elkhart Lake village, T. C. Sharpe; city of Sheboygan, first, W. J. Mallmann; second, Theodore Harms; third, John Balzer, Jr.; fourth, Joseph Cooper; fifth, Jacob Brehm; sixth, Ernst Lutze; seventh, H. W. Oehlmann; eighth, Robert Neumeister; Plymouth, first ward, H. W. Fischer; second, C. R. Mead. Rhine, George W. Wolff, chairman; Greenbush, G. S. Putnam; Herman, William F. Sieker; Holland, S. Palmer; Lima, C. D. De Long; 'Lyndon, William Auckland; Mitchell, John F. Murray; Mosel, Fred Festerling; Plymouth, H. Waterman; Russell, Dennis Harkins; Sheboygan, Owen Gearlds; Sheboygan Falls, Carl Schlichting; Sheboygan Falls village, Charles H. Weisse; Scott, J. W. Liebenstein; Sherman, G. Franzen; Wilson, Gustav Kunze; Elkhart Lake village, August Riess; city of Sheboygan, first ward, H. Schilder; second, Theodore Harms; third, John Balzer, Jr.; fourth, Joseph Cooper; fifth, Christ Hoppert; sixth, George W. Schmitt; seventh, H. W. Oehlmann; eighth, William Geussenhainer; Plymouth, first ward, H. W. Fischer; second, E. A. Kennedy. Rhine, George W. Wolff, chairman; Greenbush, John Gannon; Herman, William F. Sieker; Holland, S. Palmer; Lima, C. D. De Long; Lyndon, W. A. Barber; Mitchell, Thomas Mangan; Mosel, Fred Festerling; Plymouth, H. Waterman; Russell, Dennis Harkins; Sheboygan, Owen Gearlds; Sheboygan Falls, Carl Schlichting; Sheboygan Falls village. 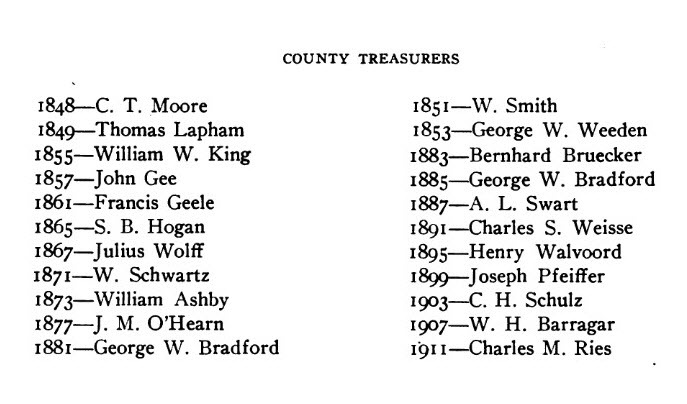 Lane Constance; Scott, George W. Koch; Sherman, E. C. Stratton; Wilson, Gustav Kunze; Elkhart Lake village, August Riess; city of Sheboygan, first ward, Henty Schilder; second, Theodore Harms; third, Richard Nommensen; fourth, Horace Pott; fifth, Christ W. Hoppert; sixth, Ernst Lutze; seventh, J. N. Nickel; eighth, William Geussenhainer; Plymouth, first ward, H. W. Fischer; second, Asa Carpenter. Rhine, George W. Wolff, chairman; Greenbush, John Gannon; Herman, William F. Sieker; Holland, C. J. Huenink; Lima, G. J. Tempas; Lyndon, W. A. Barber; Mitchell, Thomas Mangan; Mosel, Fred Festerling; Plymouth, H. Waterman; Russell, Dennis Harkins; Scott, George W. Koch; Sheboygan, Owen Gearlds; Sheboygan Falls, Carl Schlichting; Sheboygan Falls village, A. A. Wachter; Sherman, E. C. Stratton; Wilson, Gustav Kunze; Elkhart Lake village, August Riess; city of Sheboygan, first ward, Henry Schilder; second, Theodore Harms; third, Richard Nommensen; fourth, Horace Pott; fifth, C. W, Hoppert; sixth, Ernst Lutze; seventh, A. H. Strains; eighth, H. Klemme; Plymouth, first ward, H. W. Fischer; second, E. 0'Connell. Rhine, George W. Wolff, chairman; Greenbush, John Gannon; Herman, William F. Sieker; Holland, S. Palmer; Lima, C. D. De Long; Lyndon, W. A. Barber; Mitchell, J. J. Crosby; Mosel, Fred Festerling; Plymouth, Henry Wheeler; Russell, Dennis Harkins; Scott, George W. Koch; Sheboygan, Owen Gearlds; Sheboygan Falls, John Dassow; Sheboygan Falls village, Charles H. Weisse; Sherman, E. C. Stratton; Wilson, Gustav Kunze; Elkhart Lake village, August Riess; Cedar Grove village, Adrian Fonteine; city of Sheboygan, first ward, Henry Schilder; second, Theodore Harms; third, Richard Nommensen; fourth, Charles Biwan; fifth, C. H. Hoppert; sixth, Ernst Lutze; seventh, A. H. Strains; eight, John Brandl; Plymouth, first ward, H. W. Fischer; second, E. O'Connell. Rhine, George W. Wolff, chairman; Greenbush, John Gannon; Herman, William F. Sieker; Holland, S. Palmer; Lima, C. D. De Long; Lyndon, W. A. Barber; Mitchell, J. J. Crosby; Mosel, C. Augustine; Plymouth, Henry Wheeler; Russell, Dennis Harkins; Scott, George W. Koch; Sheboygan, Owen Gearlds; Sheboygan Falls, John Dassow; Sheboygan Falls village, Charles H. Weisse; Sherman, G. Franzen; Wilson, Gustav Kunze; Elkhart Lake village, W. P. Schwartz; Cedar Grove village, Adrian Fonteine; city of Sheboygan, first ward, William Roenitz; second, Theodore Harms; third, Richard Nommensen; fourth, William Peterson; fifth, Hugo Froehlich; sixth, Julius Witte; seventh, Louis Meier; eighth, John Brandl; Plymouth, first ward, H. W. Fischer; second, E. 0*Connell. Rhine, George W. Wolff, chairman; Greenbush, John Gannon; Herman, W. F. Sieker; Holland, G. H. Te Stroete; Lima, C. H. De Long; Lyndon, W. A. Barber; Mitchell, John J. Gill; Mosel, Charles Augustine; Plymouth, Henry Waterman; Russell, Dennis Harkins; Scott, George W. Koch; Sheboygan, Owen Gearlds; Sheboygan Falls, August Habighorst; Sheboygan Falls village, John Blust; Sherman, G. Franzen; Wilson, G. C. Granger; Elkhart Lake village, William Schwartz; Cedar Grove village, H. Ruslink; city of Sheboygan, first ward, William Roenitz; second, Fred Telgener; third, Richard Mommensen; fourth, J. P. Jensen; fifth, Jacob Brehm; sixth, Ernst Lutze; seventh, Louis Meier; eighth, John Brandl; Plymouth, first ward, H. W. Fischer; second, E. M. O'Connell. Rhine, George W. Wolff, chairman; Greenbush, John Gannon; Herman, W. F. Sieker; Holland, G. H. Te Stroete; Lima, C. D. De Long; Lyndon, W. W. Ford; Mitchell, John J. Gill; Mosel, Charles Augustine; Plymouth, George Meyer; Russell, Dennis Harkins; Scott, George W. Koch; Sheboygan, Charles M. Ries; Sheboygan Falls, August Habighorst; Sheboygan Falls village. Otto B. Weisse; Sherman, G. Franzen; Wilson, G. W. Granger; Elkhart Lake village, William Schwartz; Cedar Grove village, H. Ruslink; city of Sheboygan, first ward, William Roenitz; second, Fred Telgener; third, Richard Nommensen; fourth, J. P. Jensen; fifth, Charles Haack; sixth, Julius Witte; seventh, Louis Meier; eighth, Emil Nehrlich; Plymouth, first ward, H. W. Fischer; second, Asa Carpenter. 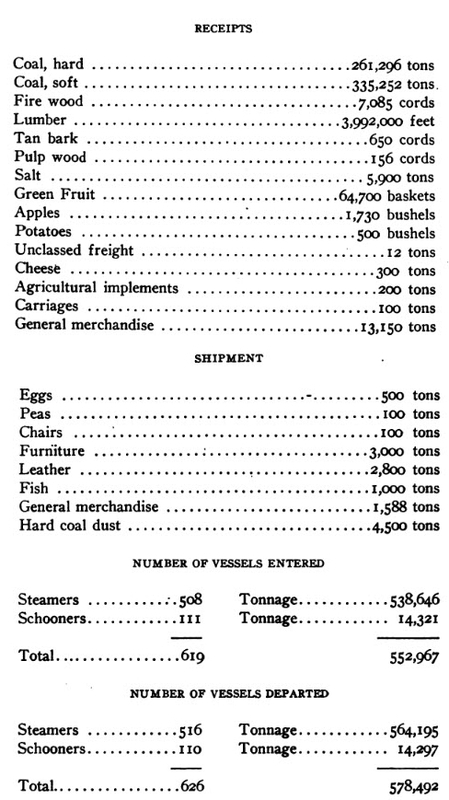 Sherman, G. Franzen, chairman; Greenbush, John CJannon; Herman, August Frome; Holland, G. H. Te Stroete; Lima, C. D. De Long; Lyndon, W. W. Ford; Mitchell, L. P. Reilly; Mosel, Charles Augustine; Plymouth, George Meyer; Rhine, George W. Wolff; Russell, Dennis Harkins; Scott, George W. Koch; Sheboygan, Charles M. Ries; Sheboygan Falls, George Ubbelohde; Sheboygan Falls village, Otto B. Weisse; Wilson, G. B. Granger; Elkhart Lake village, W. Schwartz; Cedar Grove village, H. Ruslink, city of Sheboygan; firstward, W. C. Roenitz; second, Fred Telgener; third, George Rietow; fourth, J. P. Jensen; fifth, Julius Froehlich; sixth, Ernst Lutze; seventh, William Sauter; eighth, Emil Nehrlich; Plymouth, first ward, H. W. Fischer; second, Asa Carpenter. 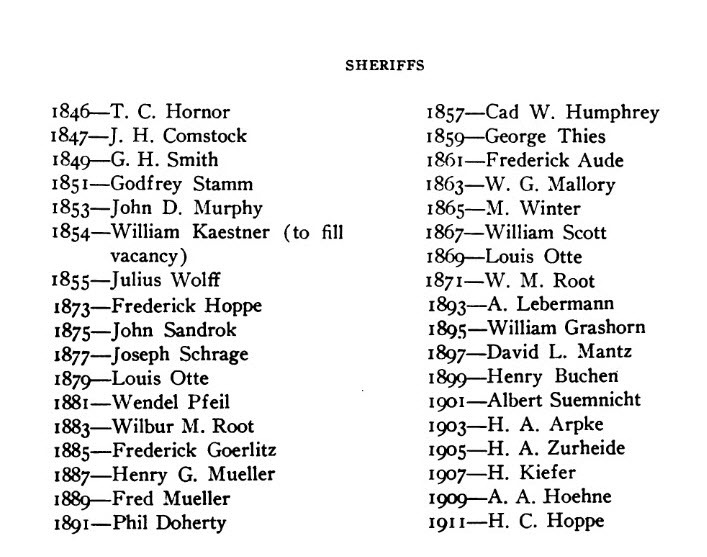 Sherman, G. Franzen, chairman; Greenbush, George Putnam; Herman, August Frome; Holland, G. H. Te Stroete; Lima, C. D. De Long; Lyndon, W. W. Ford; Mitchell, L. P. Reilly; Mosel, Charles Augustine; Plymouth, George Meyer; Rhine, George W. Wolff; Russell, Dennis Harkins; Scott, George W. Koch; Sheboygan, Charles M. Ries; Sheboygan Falls, George Ubbelohde; Sheboygan Falls village, O. B. Weisse; Wilson, G. B. Granger; Elkhart Lake village, W. Schwartz; Cedar Grove village, H. Ruslink; city of Sheboygan, first ward, W. C. Roenitz; second, Fred Telgener; third, Carl Zillier; fourth, J. P. Jensen; fifth, H. Hinze; sixth, Ernst Lutze; seventh, Christ Herges; eighth, Emil Nehrlich; Plymouth, first ward, H. W. Fischer; second, Asa Carpenter. Scott, George W. Koch, chairman; Greenbush, George Putman; Herman, August Frome; Holland, G. H. Te Stroete; Lima, Jerry Hagerty; Lyndon, W. W. Ford; Mitchell, Bart Donahue; Mosel, Charles Augustine; Plymouth, Henry Ott; Rhine, George W. Wolff; Russell, John B. Huberty; Sheboygan, Charles M. Ries; Sheboygan Falls, George Ubbelohde; Sheboygan Falls village, Lane Constance; Sherman, G. Franzen; Wilson, G. B. Granger; Elkhart Lake village, August Riess; Cedar Grove vill?ige, H. Ruslink; city of Sheboygan, first ward, W. C. Roenitz; second, George W. Leberman; third, Carl Zillier; fourth, J. P. Jensen; fifth, Julius Froehlich; sixth, Joseph Giese; seventh, Richard Nommensen; eighth, Emil Nehrlich; Plymouth, first ward, H. W. Fischer; second Asa Carpenter. Scott, George W. Koch, chairman; Greenbush, G. W. Putman; Herman, A. Frome, Jr.; Holland, G. H. Te Stroete; Lima, J. Hagerty; Lyndon, W. W. Ford; Mitchell, Bart Donahue; Mosel, C. Augustine; Plymouth, Henry Ott; Random Lake village, James Leahy; Rhine, Jacob F. Miller; Russell, John B. Huberty; Sherman, E. C. Stratton; Wilson, William Brehm; Sheboygan, C. M. Ries; Sheboygan Falls, G. W. Ubbelohde; Sheboygan Falls village, Louis Weisse, Elkhart Lake village, William Schwartz; Cedar Grove village, H. Ruslink; city of Sheboygan, first ward, H. Neuens; second, F. Telgener; third, William E. Zimmerman; fourth, J. Steffes; fifth, August Hinze; sixth, Otto Joerns; seventh, Max Schurrer; eighth, E. Nehrlich; Plymouth, first ward, H. W. Fischer; second, Asa Carpenter. Lyndon, W. W. Ford, chairman; Greenbush, G. N. Putnam; Herman, August Frome, Jr.; Holland, G. H. Te Stroete; Lima, Jerry Hagerty; Mitchell, J. J. Crosby; Mosel, Charles Augustine; Plymouth, Henry Ott; Rhine, J. F. Miller; Russell, J. 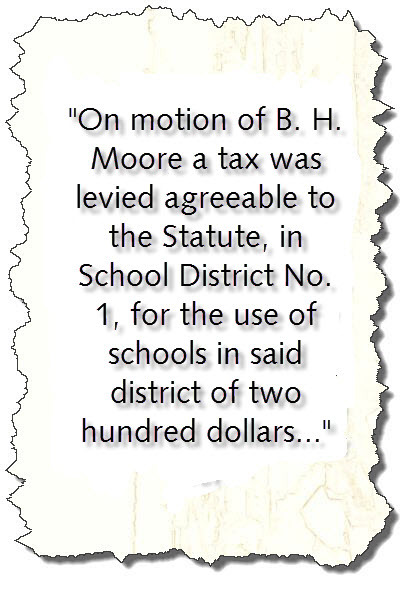 B. Huberty; Scott, J. W. Liebenstein; Sheboygan, Charles M. Ries; Sheboygan Falls, G. W. Ubbelohde; Sheboygan Falls village, Louis A. Weisse; Sherman, Fred W. Ferk; Wilson, William Brehm; Cedar Grove village, John Mentink; Elkhart Lake village, W. P. Schwartz; Random Lake village, G. Franzen; city of Sheboygan, first ward, A. E. Knauf; second, George W. Leberman; third, W. E. Zimmerman; fourth, John B. Steffes; fifth, August Hinze; sixth, Fred Hidde, Jr.; seventh, Max Schurrer; eighth, Emil Nehrlich; Plymouth, first ward, H. W. Fischer; second, Asa Carpenter. Lyndon, W. W. Ford, chairman; Greenbush, George W. Putnam; Herman, Joseph Silbernagel; Holland, G. H. Te Stroete; Lima, Jerry Hagerty; Mitchell, J. J. Crosby; Mosel, B. Schreiber; Plymouth, Henry Ott; Rhine, J. F. Miller; Russell, G. Brueckbauer; Scott, J. W. Liebenstein; Sheboygan, Charles Ries; Sheboygan Falls, George W. Ubbelohde; Sheboygan Falls village, Louis A. Weisse; Sherman, John Ingelse; Wilson, William Brehm; Cedar Grove village, John Mentink; Elkhart Lake village, W. P. Schwart; Oostburg village, W. H. Sprangers; Random Lake village, John G. Franzen; Sheboygan city, first ward, A. E. Knauf; second, George W. Lebermann; third, W. E. Zimmermann; fourth, J. B. Steffes; fifth, August Hinze; sixth, Fred Hidde; seventh. Max Schurrer; eighth, P. Hinkelmann; Plymouth, first ward, C, W. Fischer; second, E. E. Eastman. Lyndon, W. W. Ford, chairman; Greenbush, W. D. Scott; Herman, Joseph Silbernagel; Holland, G. H. Te Stroete; Lima, Harry Walsh; Mitchell, John H. Mangan; Mosel, B. Schreiber; Plymouth, Henry Ott; Rhine, J. F. Miller; Russell, G. Brueckbauer; Scott, J. W. Liebenstein; Sheboygan, Charles M. Ries; Sherman, John Ingelse; Sheboygan Falls, G. W. Ubbelohde; Wilson, William Brehm; Cedar Grove village, John Mentink; Elkhart Lake village, August Riess; Oostburg village, J. W. Hesselink; Random Lake village, E. A. Haehnke; Sheboygan Falls village, Peter Ingelse; Sheboygan city, first ward, A. E. Knauf; second, G. W. Lebermann; third, W. E. Zimmermann; fourth, J. B. Steffes; fifth, C. E. Hinze; sixth, Hans Sattler; seventh, Max Schurrer; eighth, P. Hinkelmann; Plymouth, first ward, C. W. Fischer; second, E. E. Eastman. Rhine, Jacob F. Miller, chairman; Greenbush, W. D. Scott; Herman, Joseph Silbernagel; Holland, G. H. Te Stroete; Lima, Henry Walsh; Lyndon, Henry W. Timmer; Mitchell, John T. Mangan; Mosel, Bemhard Schreiber; Plymouth, Henry Ott; Russell, G. Brueckbauer; Scott, J. W. Liebenstein; Sheboygan, H. H. Engelking; Sheboygan Falls, George W. Ubbelohde; Sherman, John Ingelse; Wilson, William Brehm; Cedar Grove village, John Mentink; Elkhart Lake village, August Riess; Oostburg village, J. W. Hesselink; Random Lake village, E. H. Haehnke; Sheboygan Falls village, C. G. Peck; Sheboygan city, first ward, A. Knauf; second, Charles Hoppert; third, W. E. Zimmermann; fourth, John B. Steffes; fifth, Albert Rust; sixth, Charles Burhop; seventh, Max Schurrer; eighth, Peter Bartzen; Plymouth, first ward, William Graef , second, G. L. Gilman.